Can I Listen to Christmas Music Yet? Via Can I Listen to Christmas Music? 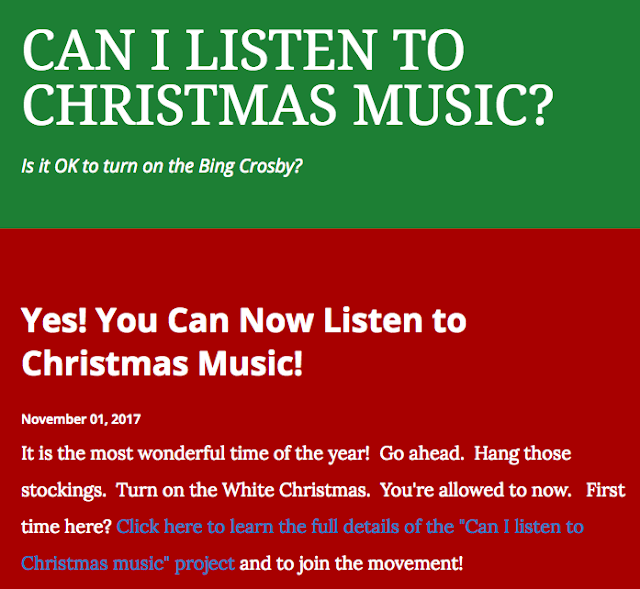 Yesterday, I flipped the annual switch from "No" to "Yes" on the Can I listen to Christmas music? project. I've been saying for the past few years that Thanksgiving "needs a better PR agency" because we go straight from October 31st --> zoom --> Christmas. Billboards, ads, in store displays. All holidays. And not Thanksgiving. The last bastion of Thanksgiving buzz seems to be the grocery store and endcaps. There are plenty of folks that aren't turkey producers who drive a lot of volume at Thanksgiving. I've chronicled [Christmas Creep] here on the blog over the years where I've posted photos of stores and others inching Christmas up in the calendar year. And, I've consistently said that I'm totally fine with it. I, for one, welcome our Christmas season overlords. Bring on the Elf on the Shelf. Bring on the Advent calendars. Bring on the Lionel O Gauge Christmas train. And...bring on the Christmas music. The "Can I Listen to Christmas Music Countdown Clock" gives you cover and you can point to it if your spouse or kids question your choices. Go ahead and turn on your favorite holiday music. It is ok.